This summer, the rewilding team has been busy designing a Tented Camp experience in the Southern Carpathians rewilding landscape. The infrastructure for the Tented Camp is made up of highly durable tents and other amenities designed to provide comfort for tourists who want to spend a couple of nights in a remote and wild natural area, explore the surroundings with specialized wildlife guides but also offer an exclusive experience to those who are not the usual campers. Testing the Tented Camp equipment in Southern Carpathians rewilding landscape, Romania. A new member of the team here is Georg Messerer, a Wildlife Tourism Officer who has taken on the task of training local future nature guides, passing on the experience gained from Simon Collier, Wildlife Tourism Manager in Rewilding Europe. Georg is a lead guide from Germany, trained in eco-tourism in South Africa and is now volunteering in the Tarçu Mountains as part of the rewilding initiative, focusing on the bison release area near Armeniş. This summer I spent four days camping out in the bison release area, testing out the Tented Camp as we were in preparation to open the facilities to the first guests this fall. It was a great experience I spent with young locals aspiring to become bison and wildlife guides. This was the first step of the Guide Training course that took place this summer. 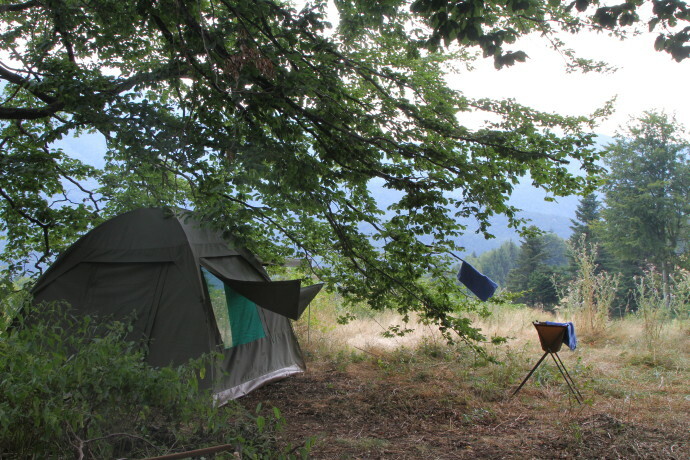 We pitched the tent in-between two large beech trees overlooking the picturesque landscapes. With a view on the rewilding area, we even managed to get a glimpse of the bison as they slowly grazed their way up the hill, very unaware of us watching from the top. 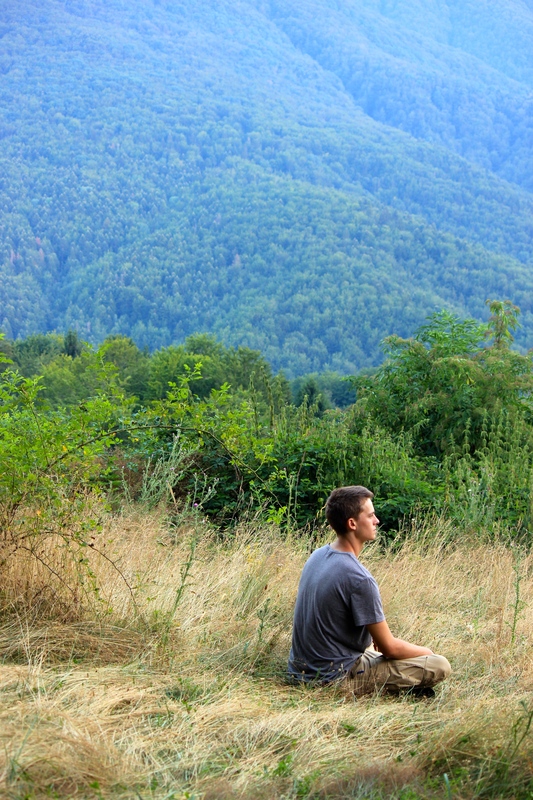 Georg Messerer observing the bison release area and enjoying the Tented Camp wilderness experience in Southern Carpathians rewilding landscape, Romania. After a very relaxing sleep, we woke with the sun and set out early for a walk through the surrounding forest. We were discussing tracks and droppings left behind by the animals we missed during the night, identifying birds as they called from the canopy or hopped through the leaf litter and interpreting and observing anything we found along our path. The best way to spend mid-day heat time is by drinking some coffee and reading a book, which is precisely what we were doing. Cooling down and letting your batteries recharge is a part of the wilderness experience we are putting together for wildlife lovers who wish to visit the Tarçu Mountains in Romania. Vitali, one of the aspiring guides, unfortunately had to leave early. Therefore, after eating some lunch, we quickly walked down the hill as a short shower of rain burst out on us, caused by the severe heat. The rain turned out to be more of a refreshment than a nuisance but was over after just a few minutes. Vitali got a ride back to the village with the Bison Rangers, while I took the opportunity to refill my bottles with water from a fresh mountain spring. 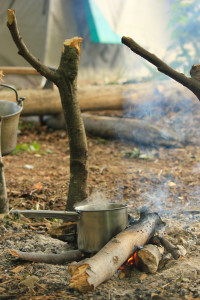 Back at camp, I re-lit the fire and prepared some dinner, while enjoying the smells that the rain had unleashed around me. The nights spent on my own are of course very different from those spent in company. One tends to be more alert and silent, less distracted and more aware of things – creating a more thrilling experience, but also can doubt one’s sanity when confronted with certain situations. The second night I was enjoying the cooling winds that blew up from the valley touching my tent. I welcomed it as it allowed me to slip into my sleeping bag without being too warm. Having my tent flaps open also made it possible to watch the moon slowly drop behind the mountain ridges and watch the scenes disappear into the darkness. I drifted off before I knew it. I woke up just as unexpectedly by the crunching sound of leaves close by on an eerily silent background. Gradually the crunching increased until I heard a sniffing sound right next to the side of the tent on which I laid wide-awake. I went through all the options of what animal it could be and tried to rationalize away all the unwanted ones, until I heard an unusual scratching sound. It was then that I got up to look through the mesh and faintly made out the spiny, rounded back of a hedgehog. Involuntarily scratching its quills up against the canvas as it sniffed out the underside of the tent. Then calmly shuffling his way around it, it eventually moved off. Leaving me with a chuckle and wondering how such a small creature can sniff so loudly with such a little nose. Preparing coffee on the campfire. The beauty of waking up in the wilderness is that, inevitably, you are already part of it. The birds have just started calling, the nocturnal animals have gone back to their daytime roosts or burrows and the crickets have stopped their cacophony of chirping. There is no need to adjust ones attitude or changing it all together. You have not missed the morning rise of daily activities and you have just gotten to experience the wilderness from its other, less obvious side. The hooting of the secretive owls, occasional alarm calls from animals disturbed by predators and the crunching of footsteps from unknown shapes and sizes. It is from this starting point, while you are out in the morning looking at the tracks and signs that you are able to put together all the pieces of the stories that have taken place during the night. Luckily, we are still scouting out the area for potential locations to host our guide training and to continue gaining these valuable experiences. I had to get back to the village but I am very much looking forward to get back to the wilderness as soon as possible. You will be able to try out our wilderness experience in the Southern Carpathians rewilding area spreading in the Tarçu Mountains, starting this fall. Keep up to date with the latest news and find out about the grand opening of the Tented Camp at the Rewilding Southern Carpathians Facebook page.